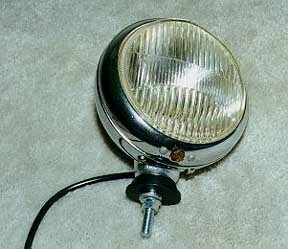 An ever-expanding collection of information, photos, and data about fog lamps, bulb types, and related items. The Hella fog lamp chart was added November 25, 2004. 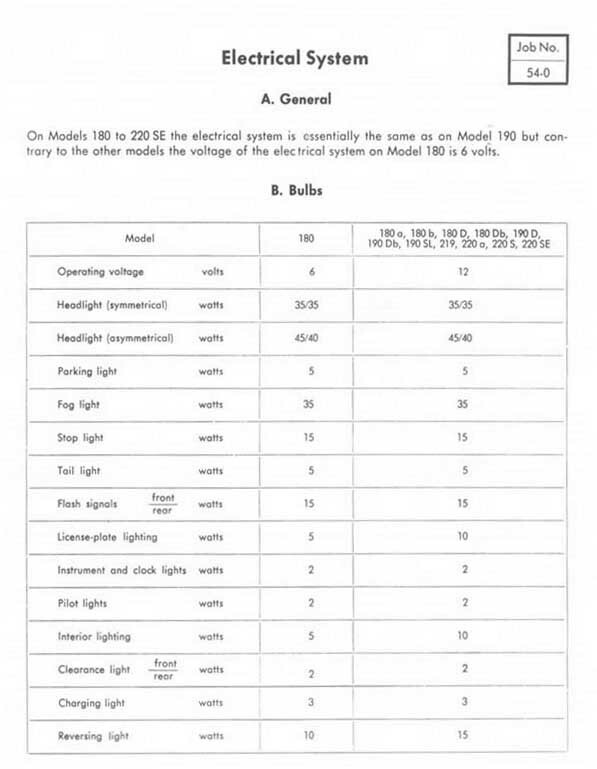 Corresponding fog lamp bracket chart (page 1.08) added December 1, 2004. 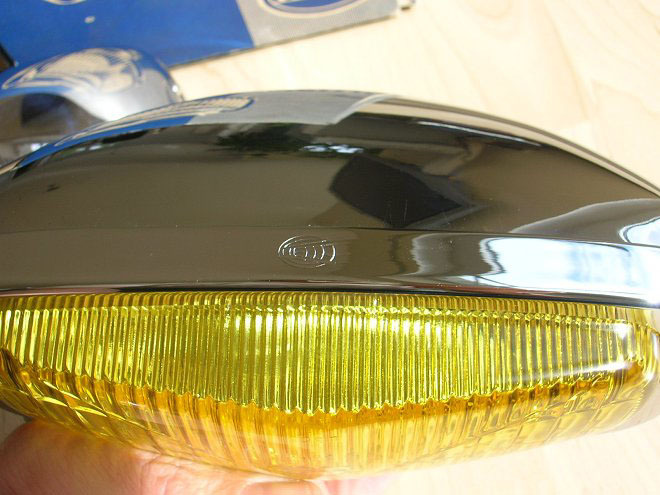 The items listed on the Hella fog lamp charts are no longer available, and have been provided here for historical reference only. Jobs 82-19/1, 82-19/2, 82-19/3 were added February 3, 2015. 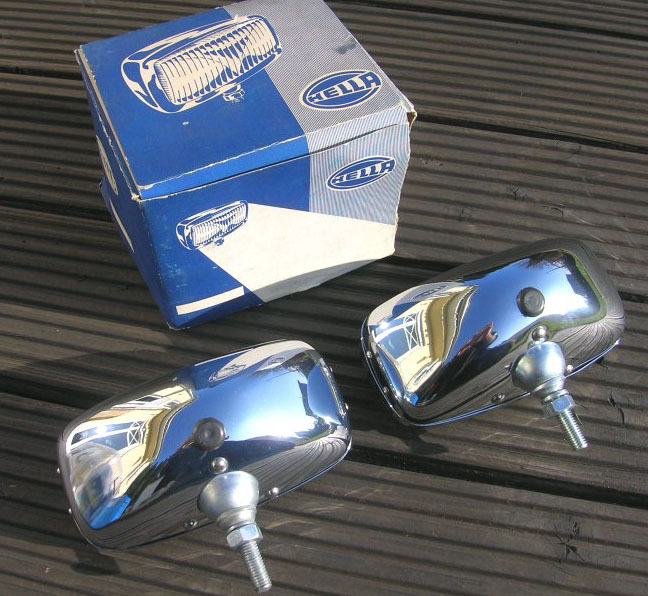 OEM (Bosch / Hella) fog lamps are available from the factory again! 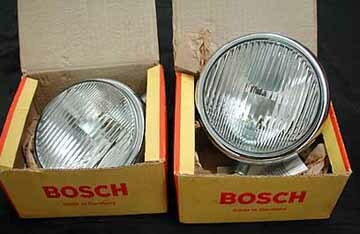 The original Bosch and Hella fog lamps for the Mercedes-Benz Ponton sedans, coupés and cabriolets are available from the Mercedes-Benz Classic Center in Germany, as well as local authorized agents (dealerships) around the world. 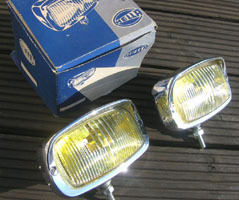 The new fog lamp lenses are plastic, whereas the originals were glass. 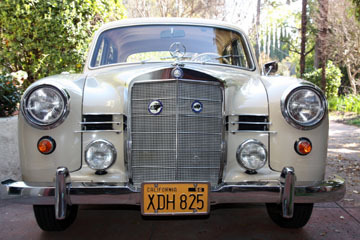 Order them directly through the Classic Center or MBUSA (800-FOR-MERCEDES) or contact an authorized Mercedes-Benz agent. See the Links page for contact information. 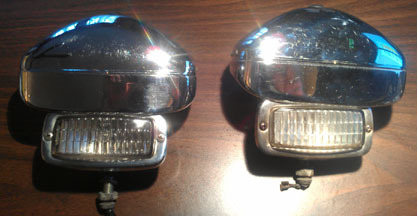 Until recently, these fog lamps were considered rare, and virtually unavailable in new condition. Remove the hexagonal screw at the bottom of the chrome trim ring assembly that surrounds the glass lens. Remove the chrome trim ring assembly by pulling forward and up on the bottom of the trim ring. The trim ring assembly is "hinged" at the top, and will immediately separate from the chrome housing. 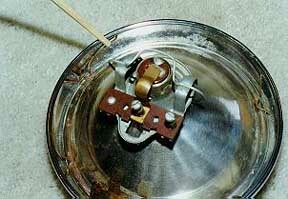 The trim ring assembly will not completely separate from the chrome housing because of the attached electrical wires. 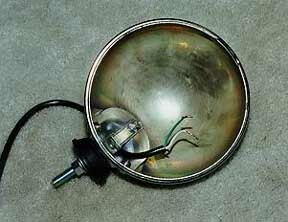 Disconnect the electrical wires by unscrewing them at the studs with a slotted screwdriver, or remove the bulb assembly from the mirror reflector by rotating the wire clip off the bulb housing, and pull bulb assembly out of mirror reflector. I prefer the latter. If you only intend to replace the bulb, it may now be replaced. 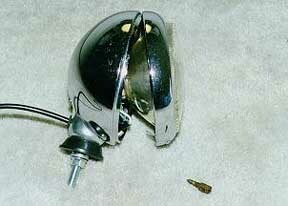 On a workbench, place the chrome trim assembly lens down. 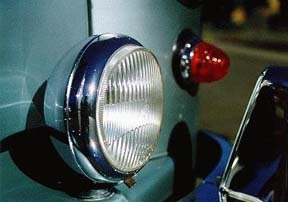 You will see 4-6 wire clips under the chrome trim ring, holding the mirror reflector in place. Remove all the wire clips by pushing down and in on the longer end of each wire clip. This is best done with your index finger, I believe needle-nosed pliers may work, but may also cause damage in the event of a slip. With the wire clips removed, the mirror reflector will pull out of the chrome trim ring. Looking into the front of the mirror reflector, you should see a bulb shade attached to the mirror reflector in slots at the top and bottom of the mirror reflector. 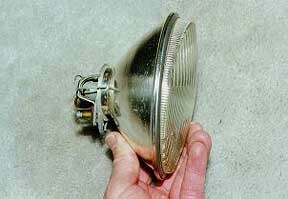 In practice, most bulb shades are rusted badly and may be detached or missing, especially at the bottom. 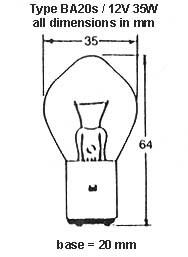 The bulb shade is a small half hemisphere with two attachment arms, which fits in front of the bulb. 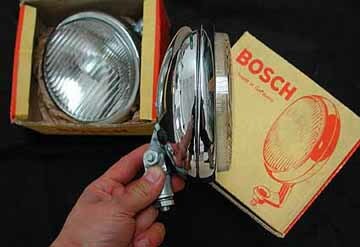 Its purpose is to cut off and concentrate the upper part of the light beam as it leaves the mirror reflector. Remove the glass lens from the chrome trim ring. Assembly is the reverse of disassembly! Hella fog lamp on 1959 220S Ponton sedan. Note "brimmed" lens, which is thicker at top than bottom, with Hella logo in center. 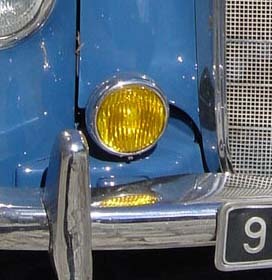 Bosch fog lamps on a 1957 220S Ponton coupé. The Bosch logo is on the lens. Push down on long arm of spring retainer clips to release lens and mirror reflector from lens trim. 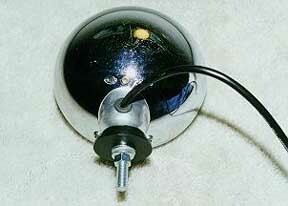 Rotate socket clip away, and pull bulb socket out of mirror reflector. 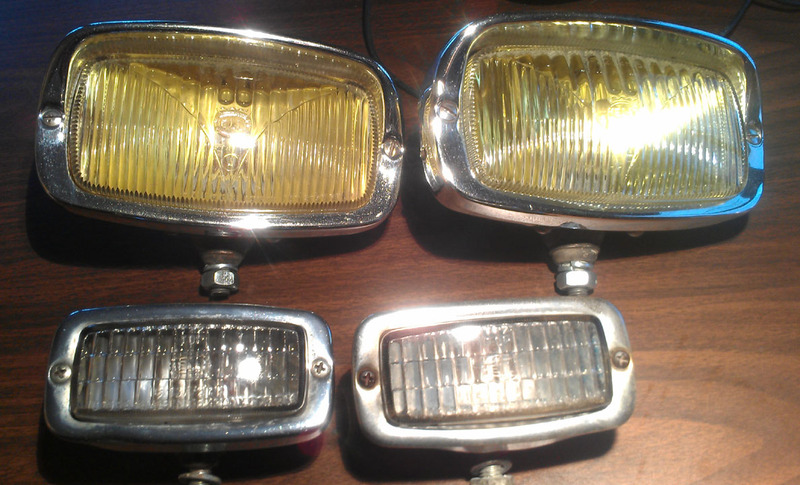 These rectangular, OEM (Hella) fog lamps were installed on Jeff Miller's 1957 Type 190 (W121 I) sedan in Germany between 1957-1980. 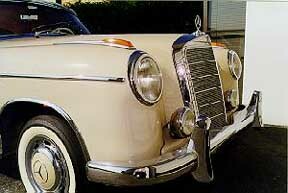 They are more common on the Type 190SL roadster (W121 II) manufactured after 1959. 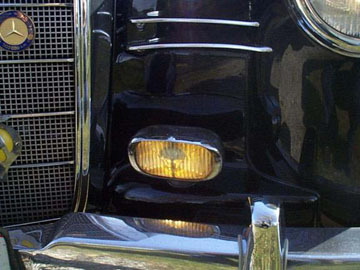 What is shown in this photo is the late style (version 3, starting 1959) "hooded" fog lamp as typically used on the (W121 II) 190SL roadster (after chassis 951008). The 300SL "Gullwing" coupé (W198 I) used a non-hooded assembly. The term "hooded" refers to the way the chrome bezel (body or shell) extends over the top of the lens. 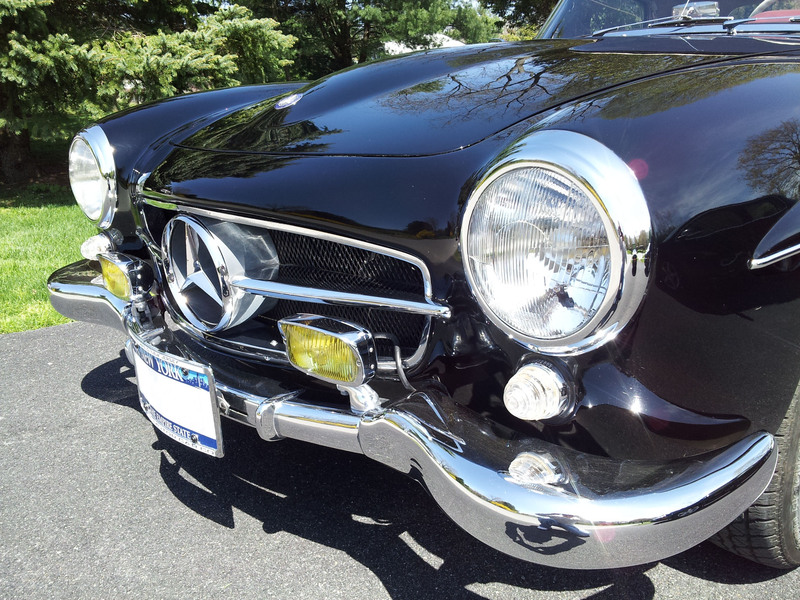 The 190SL also used the first version of the non-hooded style fog lamp on the early cars. 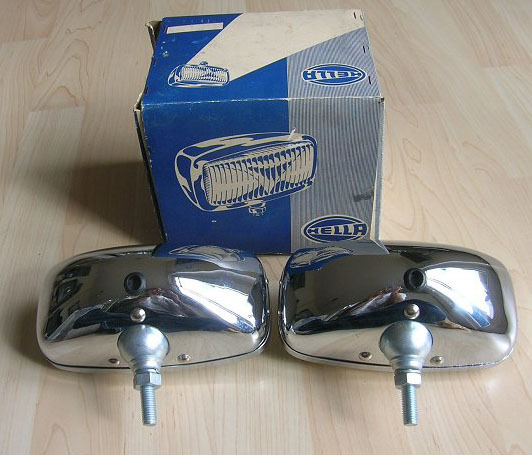 On these two early versions, only the lenses were different. The hooded style (version 3), which started in 1959 for the 190SL also had a different lens, and was too late for the Gullwing (production ended in 5/1957). 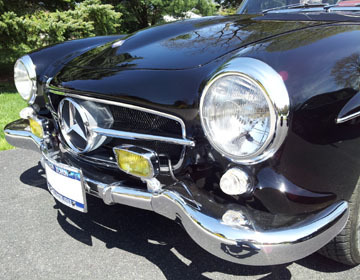 I believe the 300SL roadster (W198 II) had the fog lamps incorporated in the headlight assembly. Most of the lenses are still available. 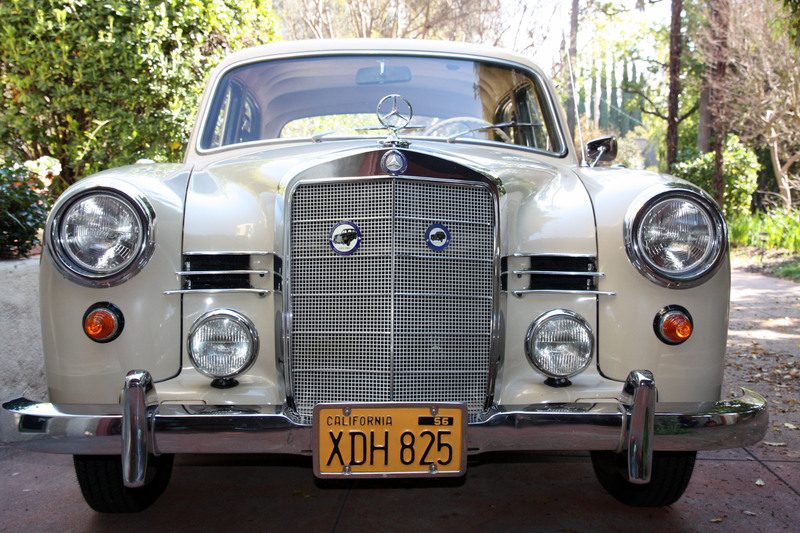 The Type 190SL (W121 II) production ran from 5/1955-2/1963. New OEM fog lamps became available again from the factory in 2002. However, the original glass lenses were superseded by plastic. This lens has uniform thickness from top to bottom. Compare to the "brimmed" lenses (thicker at top than bottom) elsewhere on this page. 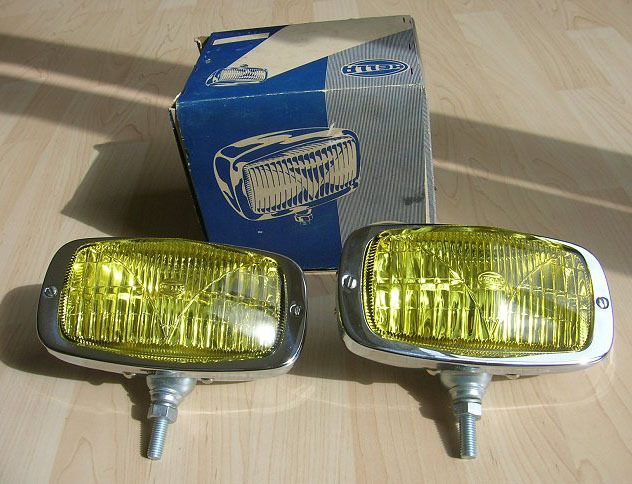 This set is slightly different from the ones shown in the Hella fog lamp chart (illustrated .pdf / circa 1961). These were offered on eBay in May 2010 for a whopping $1,475 plus $69.00 shipping. 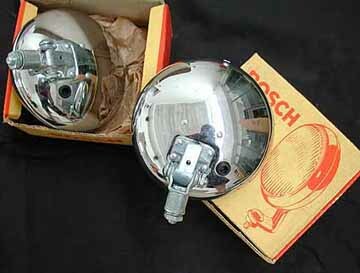 These accessories were original to the Mercedes-Benz Type 190SL roadster, and the 300SL "Gullwing" coupé. 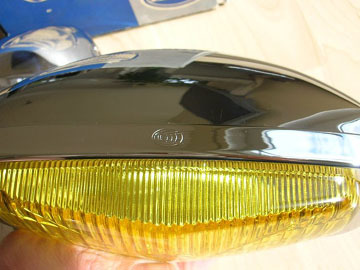 Reference Hella fog lamp chart: The chrome housing appears similar to item 10, but the glass lens pattern is closer to item 11. 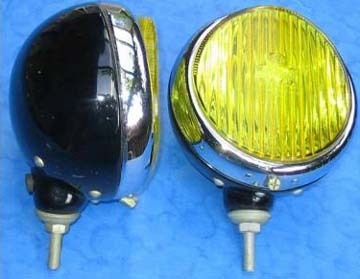 By law and regulations in Europe all rear fog lamps have to be red, like the one shown here. Rear fog lamps were introduced in 1955 for the official cars of government and later made available to general public. German-made Narva BA20s No. 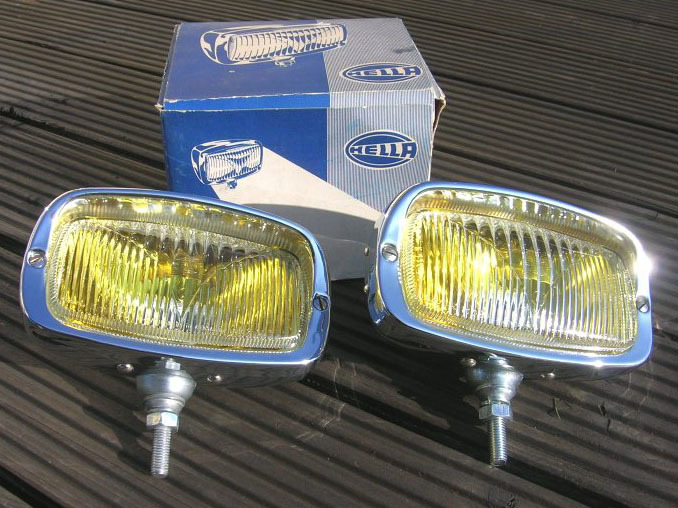 49072 fog lamp replacement bulbs for Mercedes-Benz Pontons. 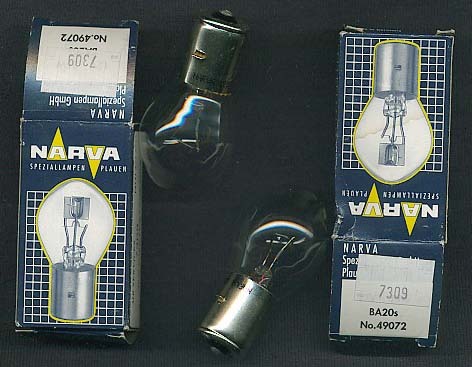 Text printed on the base of the bulb: "Narva 12V F2 35W E10 2C7." 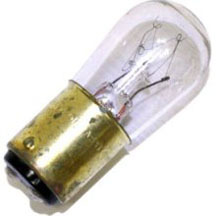 The equivalent (12V, 35W, BA20s) OEM bulb is, Osram No. 7309. Check with your local supplier first. If that fails, reference the "Lighting" section on the Links page, or search the internet for, "12V 35W BA20s." 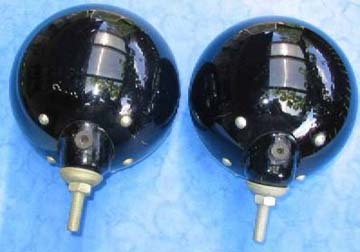 Job Number 54-0 from the Service Manual Model 190 (SM-1207-000) listing the light bulbs used in the Mercedes-Benz Ponton series including the sedans, coupés and cabriolets made from 1953-1962. Numbers in the far right column are DIN (German Institute for Standardization) and are used by Mercedes-Benz. 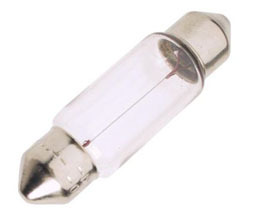 Mercedes-Benz fog lamp bulb (072601-012600) is shown as 12V 15W (fifth bulb down on the chart), but the power rating should be 35W.